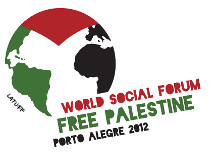 The 10 days in Porto Alegre, Braziland and the final 3 days at the World Social Forum Free Palestine was a great experience with many ups and downs. I was there representing the Mayfirst/People Link community as our community participated and offered the web space for the wsfpalestine web site and supported the mailing lists (mailman) and newsletter software (civicrm) amongst many other technical issues preparing for the event and putting together a panel discussing defending human rights on and off line. I arrived in Porto Alegre on November 23rd in the morning and immediately made it to the hotel. By the afternoon I was in the WSF Free Palestine office working on many different technical and physical needs. Things seems to be going well, but like any conference that people may have been too or planned the final days before things kick off were filled with stress and lots of activity. It was a bit crazy at points, but I’ll spare the details. Without any direct mention from anyone specifically, I began to pick up on political conflicts within organizing the forum, I was not privy to the details but it was a feeling I certainly had about external groups. I want to emphasize that what I write here is the opinion of me and not the opinion of Mayfirst or the US Canada Delegation I went with, and specifically this was my first interaction with the Social Forum structure and events, so there are certainly people with more extensive experience that I invite to share their thoughts. Most of my conference experiences stems from the Left Forum, Labor Notes, OccupyBoston and Tent State, but as I feel in this reflection, the outcome of this forum is very similar to many radical conferences I have attended in the past, though I think this forum has much farther reaching connections, not just geographically but geopolitically. Let me begin briefly by where things ended and work back, some may have heard there was a big commotion at the end of the forum at the final assembly, which was supposed to be a place for decisions to be made but turned into a stage fight that reminds me of communist, socialist and anarchist conflicts that many know from the industrial revolution around the world, but in this case it seems the so-called higher powers played a role, in that it was like the State of Brazil and the Palestinian Authority at least from my observation trying influence the members of the forum to not speak against the statehood bid. In part it seems the contention led to deflating some of the impact of the forum, meaning more oganizing is needed. As colleague said this forum on Palestine felt like a trial run and that we need another on the same theme of Free Palestine. a simple message that all could rally around. But as we brought the banner to the front we ran into a specific problem the CUT was leading the march followed by the PT and had a banner already there saying “Estado de Palestina” (the State of Palestine). This was odd as the bid for statehood was coming up but there was no decision for the forum to support that, in fact we were days from an decisions to be made. This in part vindicated to me that the rumors of in-fighting amongst the Brazilian government and the Brazilian National Planning Council and the Palestinian National Planning Council as well as the Palestinian Authority appears to be true. As an editorial note from many discussions, this action to put the “State of Palestine” at the forefront of the march exposes that the Palestinian Authority, led by Mahmoud Abbas, was trying exert pressure on the activists at the forum, who I feel are clearly not seeing statehood in a 2 state situation as a viable option. This was not a welcome action and in fact as some explained a desperate act of Abbas to regain popularity as his coalition is losing strength in the West Bank. So in part it surprised me to see a banner saying the “State of Palestine” but at the same time became more expected as I saw the power plays trying to be made. Let me explain a little why there is a debate about the statehood bid, this comes from people I spoke with at the forum as well as the delegation I came with, which tend to have more radical activists. In part the reason people opposed the bid for non-member statehood in the UN is cause it does not address the Refugee problem, or set the boundaries of the state or eliminate the occupation. I am not a journalist and I am not trying to be, so I am leaving names out and speaking in summation to get to the point. This intervention by ,as it seems, the Brazilian Government pressure at the request of the Palestinian Authority leans on creating more internal conflicts and will make the next election interesting if it ever happens. The disappointing element is that there was clearly pressure coming from the host country to prevent discussion against the statehood bid, this stems to be preventing leftist activists like Leila Khaled from attending, as well as splitting the growing Palestinian Youth Movement members from being at the same panel at the same time and instead scheduling all their panels at the same time forcing them to split apart, as well as many other leftist activists prevented from leaving the West Bank or Gaza to attend, as it seems ,by the request of the Palestinian Authority. This is a forum that seeks to act differently than the World Economic Forum, but instead we see that those who attend the World Economic Forum sought to put pressure on the World Social Forum by bringing those in power to play a role amongst the grassroots. This does beg the question does the social forum still have its attractiveness, after all since Chavez asked an similar question in 2006 World Social Forum in Caracas , what is the plan and goal is of the forum? We have had numerous uprisings in Egypt, Greece, Spain, US, Canada, South Africa, Iran and many other places that do not seem to be deeply connected to the social forum’s themselves. I leave it with that as a question for now. I want to keep this post short and in the next post I will discuss the labor panel that I attended, and in following posts there will be discussion about the BDSmovement, but I also want to highlight some great organizations that have some very helpful information for those that are unfamiliar with the conflict and impact of the occupation and want to understand it better. Please take a look at Al Haq a great research organization that helps build international campaigns by making the legal arguments for international campaigns to use, they do not carry or organize the campaigns but seek solidarity organizations and movements to make use of their research and will work with those movements. They are small organization based in the West Bank. Please look at their virtual tour of Palestine it gives a very detailed understanding of what is happening and what is not talked about in the news or about the conflict. Another organization that was in the delegation I was a part of is the International Jewish Anti-Zionist Network, I have the greatest respect for the members of this organization as they have taken a leap that leads to many debates and arguments within families and friends about the state of Israel, it is not easy in the US to be anti-Zionist let alone being Jewish Anti-Zionist. They also put on some great workshops discussing the issue and as those videos are uploaded I will also share them with you all. Posted in Blog Post and tagged Free Palestine, Palestina Libre, palestine, World Social Forum.